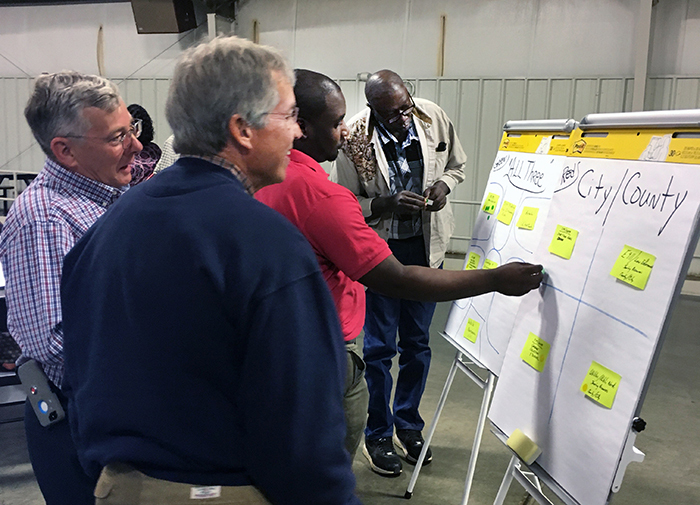 Leaders in a rural Georgia community launched a broad-based collaborative network at a unique strategic planning retreat organized by the Carl Vinson Institute of Government. Leaders with the Hancock County Board of Commissioners, Sparta City Council and the Hancock County Schools developed a community-wide strategic plan that will inform cooperative development efforts throughout the rural middle Georgia county. The two-day retreat, held Nov. 2–3, is unusual in that it brought together leaders of three diverse local government bodies. Nearly all strategic planning retreats involve single agencies or sometimes two government organizations. A follow-up meeting will be held in May to assess progress on attaining shared goals that were identified at the retreat. Hancock County Commission Chair Helen G. “Sistie” Hudson said the retreat was a positive development for local educators and government leaders. “This is the first time these three governments have come together, and the two days proved to me it’s exactly what this community needed,” she said. Faculty member Gordon Maner, who facilitates most of the planning retreats organized by the Institute, said the three-government gathering was the first he could recall in at least 20 years. Maner teamed with fellow faculty member Russ Cook to facilitate the Hancock County retreat. Sparta Mayor William Evans Jr. and Hancock County Schools Superintendent Miranda Wilson said they expect positive results from the planning session. According to Wilson, the local leaders set goals that included opening a Hancock County affiliate of the Boys & Girls Clubs of America, improving roads and emergency services, and sharing physical and personnel resources. The three governments formed a committee to follow up on attaining shared goals.